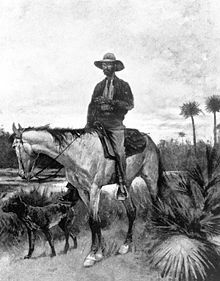 "...The Florida 'cowhunter' or 'cracker cowboy' of the 19th and early 20th centuries was distinct from the Texas and California traditions. Florida cowboys did not use lassos to herd or capture cattle. Their primary tools were bullwhips and dogs. 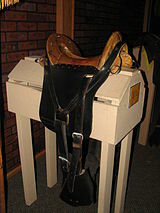 Since the Florida cowhunter did not need a saddle horn for anchoring a lariat, many did not use Western saddles, instead using a McClellan saddle . While some individuals wore boots that reached above the knees for protection from snakes, others wore brogans. They usually wore inexpensive wool or straw hats, and used ponchos for protection from rain. Cattle and horses were introduced into Florida late in the 16th century. Florida cattle and horses were small. The 'cracker cow', also known as the 'native cow', or 'scrub cow' averaged about 600 pounds, had large horns and large feet. The cracker cow type persists today in two rare breeds: Florida Cracker cattle and Pineywoods cattle. The Florida Cracker Horse descended from smaller Spanish horses of Barb, Sorraia, and Spanish Jennet breeding, but adapted further through natural selection to the environment of the region. Throughout the 17th century, cattle ranches owned by Spanish officials and missions operated in northern Florida to supply the Spanish garrison in St. Augustine and markets in Cuba. These ranches brought in some vaqueros from Spain, but many of the workers were Timucua Indians. Diseases and Spanish suppression of rebellions severely reduced the Timucua population. By the beginning of the 18th century, raids by soldiers from the Province of Carolina and their Indian allies reduced the Timucuas to a remnant and ended the Spanish ranching era. In the 18th century, Creek, Seminole, and other Indian people moved into the former Timucua areas and started herding the cattle left from the Spanish ranches. In the 19th century, most tribes in the area were dispossessed of their land and cattle and pushed south or west by white settlers and the United States government. By the middle of the 19th century white ranchers were running large herds of cattle on the extensive open range of central and southern Florida. The hides and meat from Florida cattle became such a critical supply item for the Confederacy during the American Civil War that a 'Cow Cavalry' was organized to round up and protect the herds from Union raiders. After the Civil War, Florida cattle were periodically driven to ports on the Gulf of Mexico, such as Punta Rassa near Fort Myers, Florida, and shipped to market in Cuba.